Perranwell Methodist Chapel (left) was built in 1843 and Perranwell School which was an extension of the Chapel (right) next door was built 1867. But just to confuse us the plaque on the building which was the extension says Chapel. 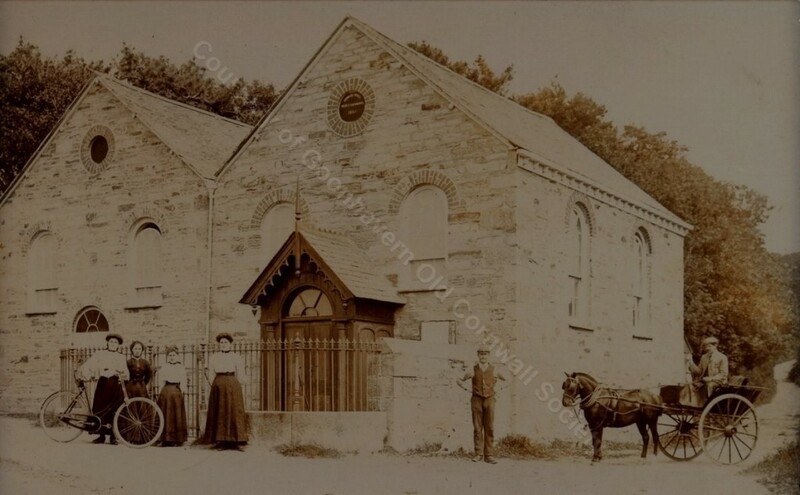 The little lady in the picture in front of the gate was Martha Pedlar who was a Sunday School teacher and Caretaker. She lived in an old cottage opposite now demolished for road widening. How she managed to deal with the ornate oil lamps in the Chapel which we raised and lowered on a pulley one will never know. – given to William Martin, Perran Well Chappel”. That was a lovely little chapel. I remember once being able to buy a carton of milk at the Harvest Festival auction for just 2p! I also remember playing the organ in there after it was closed in 1986 and before it was transferred bit by bit to Rose Chapel in 1987 where it is still played to this day.